The Class of 1942 from Paynesville High School held their 40th reunion on August in Paynesville. Attending the reunion were: (first row) Donna (Hess) Coulter, Vicki (Wegner) Jenniges, Jack Hennen, Carol (Jacobson) Bras, Irene (Lehnen) Dietrich, Tim Zniewski, Mary (Faber) Mehr, and Gerry Mehr; (second row) Carlyn (Hendrickson) Farnum, Linda (Lahr) Gruber, Marlys (Weber) Miller, Tom Scheierl, Janet (Frank) Lauer, Linda (Mackedanz) Leither, Colleen (Olson) Vinkemeier, Marcia (Hillbrand) Thelander, Sue (Hendrickson) Warner, and Ruth (Stang) Schultz; (third row) Jarolyn (Worner) Watkins, Sue (Bast) Arend, Judy (Buermann) Gottwald, Darlene (Bertram) Revermann, Colleen (Topp) Sogge, Mari Lyn (Ampe) Schestak, Jackie (Dilley) Richardson, Chuck Lauer, Doug Mehr, Gary Gruber, Tony Schmitt, Diane (Loxtercamp) Fuchs, Doug Bork, Jim Stanger, and Craig Deadrick; and (back row) Matt Rausch, Bruce Fuchs, Jerry Schroeder, Ken Schefers, Mike Flanders, Don Gilk, Bruce Dosdall, Mike Deadrick, Kevin Bruntlett, and Ruth (Mehr) Heitke. The PHS Class of 1978 held their 55-year reunion on Saturday, Aug. 8, in Paynesville. Pictured are: (front) Ursula (Kolb) Nahan, JoAnn (Johnson) Topp, Shirley (Strodtman) Larson, Donald Johnson, Duane Nicol, Darlene (Block) Wendlandt, Winnie Schuelke (secretary), and Harry Schuelke (teacher); (middle) Shirley (Nehring) Johnson, Delores (Krupke) Hoekstra, Betty (Brown) Strate, Sharon (Miller) Nistler, Nancy (Reamer) Larsen, Valeria (Kolb) Hoppe, Arlene (Fischbach) Raeker, Russell Schmidt, Bernie (Determan) Poganski, Bev (Fisherback) Reller, Liz (Jacobson) Abeln, Jerry Johnson, Don Spaulding and Jim Loomis (teacher); and (back) Bob Rud, Bill Drimel, Jack Hoppe, Bob Schmidt, Marty Glenz, Mac Brottom, Lawrence Schmidt, Earl Peterson, and Harvey Wurzburger. 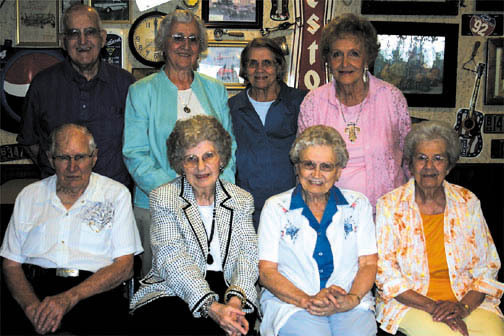 The PHS Class of 1942 celebrated their 67-year reunon on Wednesday, Aug. 5, in Paynesvile. The class originally had 36 members, of which 18 are still alive and eight attended the recent reunion. Pictured are: (front) Owen Sheldon, Valieta (Beyer) Norris, Dolores (Schrom) Stolpman, and Alice (Schmidt) Sauer; and (back) Walt Mathison, Louis (Mehr) Korman, Evelyn (Swanson) Bruntlett, and Carmen (Sheldon) Brown. The PHS Class of 1979 held their 30-year reunion on Saturday, July 25. Pictured are: (front) Peggy (Rittenhouse) Pahl, Debbie (Block) Fink, Sandy (Boie) Fenske, Cindy (Lieser) Gerding, Michele (Koglin) Mohr, Annette (Lieser) Goff, Linda (Albrecht) Voss, Lisa (Fischbach) Heff, and Linda (Henrichs) Fuchs; (middle) Steven Spanier, Loren Wendroth, Robyn (Otteson) Wendroth, Ed Ampe, Greg O'Brian, Joe Berscheid, Laura (Heairet) Martinson, Greg Cruze, and Bill Hoeft; and (back) Brian Fuchs, Cary Thelen, Ted Jaszczak, Mike Orbeck, Lon Jones, Jerry Utsch, Dan Binsfeld, Lois (Hess) Schwieger, Roxy (Schleper) Moser, and Mark Lindeman.